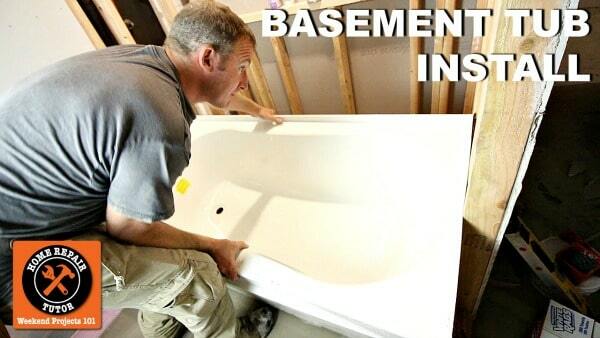 What’s the best way to install a basement bathtub? And how do you connect the tub plumbing? These are two frequent questions, and rightfully so. Basement bathtub installation isn’t easy. But today’s tutorial will make it much better, we promise. Our prior tutorial shared in great detail how to prep and self level basement floors. This step makes tub installation easier. Step one is to dry fit the bathtub. Since this basement bathroom was self leveled our bathtub was also perfectly level – but it’s always good to double check. Step two is to install the cable bath drain. Use 100% silicone to adhere the rubber gasket and drain to the tub. Step three is to dry fit the pipe and slip fitting into the P-Trap. Then dry fit the bathtub again to see how it’s drain lines up with the P-Trap pipe. Step four is to glue all the PVC floor pipes and pour mortar onto the basement floor. Step five is to set the bathtub in the mortar, drill holes through the tub lip, and secure the tub to studs using galvanized screws. And if you’re wondering, we didn’t need a stringer for this tub. 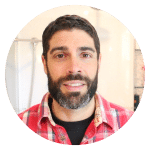 Our next video will share tips for installing the Moen mixing valve and if you’re wondering we waterproofed the adjacent floor using Hydro Ban. It really depends on the shower pan, which one are you installing? Thank you, hope it helped!